August 9, 2015. Fifty-four teams entered the 26th Annual Alice Kelly tournament with a small craft advisory in effect and little hope of fishing, but in the end the 53-foot Paul Mann Custom Boat TRUE GRIT and a few others made it out for Sunday’s fishing. 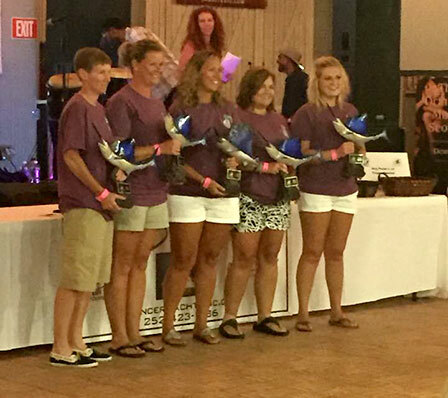 The ladies aboard TRUE GRIT took top boat with 4 white marlin releases and 400 points. The event raised almost $40,000 for cancer charities. Pretty work in every way!